Fourtitude.com - New Running Shoes.. quick help? New Running Shoes.. quick help? Thread: New Running Shoes.. quick help? I've done a few half marathons etc over the last couple of years. Been wearing lots of different brands and models of shoe. Last couple of pairs have been Asics Kayano 19 and 20 respectively. They were ok, but didn't really blow me away and also have a tendency to occasionally give me blisters, even when they are well worn in. Previous to this I've had NB and Mizuno - both without any dramas. So I'm wondering why bother pay the premium for Kayano's? Can someone recommend me a shoe that they find similar, maybe in Asics or Nike? I've been trawling around and am honestly getting confused as to the ranges available. I have a slight pro-nation (or whatever you call it) but have inserts to fix this. What are you wearing and what do you love about 'em? Non "runner" here, but I do put in about 15-20 miles a week and do a few trail 10ks throughout the year. I was steered towards Brooks a long time ago and have continued to buy them. I use Cascadias because I run off road more than on, but they have worked well for both. I'm maxed out at 4-mile runs but loving my Brooks Ghost 7s. <10.5 oz each and perfect for my gait. The universe is an intelligence test. I've been on Topos the last year, Vivos a year and a half before that and NB minimus for about 2 years prior to those. Will start by saying that you cannot just jump into it and it takes time as well as some work to do this. But you should be working on why your feet do what they do, how to address it and how to get rid of the issue. Shoes that over compensate and inserts cover up the problem, they don't fix anything. Find a neutral shoe with less heel to drop than what you have now but not 0. Work on form, work on why your feet are twisting and collapsing and build up their strength. I used to have all sorts of issues with twisting my ankles, balance (partially allergies/sinus pressure which has yet to be fixed), tripping over random stuff when I thought I lifted my foot high enough that sort of crap. Stability shoes and inserts only change how the shoe hits the ground your foot is still all F'd up inside that shoe.. fix your feet. After adapting to 0 drop neutral shoes and fixing what was wrong with me not band aiding it all that went away. And for the record this isn't about barefoot or minimalist since that just adds to all the controversy. You can have neutral shoes with minimal or no drop and a ton of padding if you need/want padding. I went to the topos at about 210-220lbs since the vivos were too thin and beating me up, they are still 0 drop but have I think like 12mm of stack to them. I just ordered some hiking shoes that are a 4mm drop (couldn't find 0s I liked) and have similar stack to the topos. Take a pair of worn shoes to a running store with your inserts. They should be able to tell you how you are running, where you are pronating and steer you in the right catagory of shoe based on what you want to do. They should be asking you questions. Each brand makes something for each catagory and price point, so it's really hard to say because a lot of it is personal preference or simply whatever works for you. New Balance used to make really nice general running shoes in different widths and types for styles of runner including custom shoes for orthodics. But since they began sourcing from Asia, it's all gone to you know what. I have always run in Asiacs and Saucony because IMO they still make pure running shoes. Barefoot running has been gaining a lot in popularity and so a lot of "running shoes" are really glorified socks. Unless you are in peak physical shape and run like a human gazelle with a flawless stride and gait, I don't recommend this entire category. Last edited by BetterByDesign; 04-02-2015 at 07:05 PM. This is exactly the opposite of how it works. People who are already in great shape and have great form are likely to get away with running in most whatever because that form is part of their muscle memory. It's people who are just starting out, or who have chronic problems who have the most to gain from using less shoe. Yes, you have to take it extremely slowly - but this is the case with beginning running under any condition, and all the more so, going from running in shoes with a thick heel, which has had the effect of shortening your Achilles, to something flatter which will cause it to stretch. You shortened it over years and decades, you can't just stretch it out in a couple of weeks, so you need to work up to it slowly. The whole point behind shoes with minimal support is that it allows your foot to give you constant feedback as to the quality of your stride. Encased in a heavy, supportive shoe, you lose that feedback, develop bad habits, that then manifest themselves in other places like your knees, back, or hips. This is exactly the opposite of how it works. People who are already in great shape and have great form are likely to get away with running in most whatever because that form is part of their muscle memory. I was thinking exactly this previously but didn't really feel like posting a response. It is the people who run 30+mpw who go low drop and get hurt if they don't ease into it. The people who are just starting and can learn good form from the beginning and are doing 0 to say 10 mpw pick it up much easier. The 30+ people can do it but it is hard to tell a runner, run less or you'll get hurt they instantly think its the shoes hurting them when it is the change in form that did. On the surface most people wouldn't say that this is a minimalist shoe but it is low drop I think 4mm? (forget) and offers no correction*, but has a decent stack. They are also really light. Barefoot I believe is on the decline, but minimalist is strong in regards to lack of correction, the stack heights are growing though as people want room for their toes to splay, they want no correction, but still want padding. *ok that stupid hump in the middle is supposed to "force" a mid foot strike which could be considered a correction. there is a Swiss brand called ON and they are pretty great. Running 20-25 miles per week on Brooks Rivenna 6's with no major issues. I have some problems with lower leg kickout on my right leg which makes shoe selection difficult for me. I've been through Nike Flex Run, Nike Free 5.0, Saucony (I forgot the model), and now the Brooks. All of them gave me blisters in the arch of the foot that kicks wide, but the Brooks was by far the best. They have been the best by far for me. I used to run on Kayano's in high school about 10 years ago. I find the Rivenna to be a big upgrade in terms of feedback. The Kayano was almost too cushioned for me. I have 120 miles on my current pair, and they seem to be holding up great. I wouldn't be surprised to get 500 miles out of them. This is exactly the opposite of how it works. People who are already in great shape and have great form are likely to get away with running in most whatever because that form is part of their muscle memory. It's people who are just starting out, or who have chronic problems who have the most to gain from using less shoe. And 90% of people are not in great shape and do not have correct form so what you are saying applies to an ideal situation that rarely exists, except when one is writing articles for magazines. So in reality it's the opposite of how it works. The thing is, you won't run in a minimalist shoe the same way you run in a shoe with a big padded heel. Try it yourself. Run 100 yards on a track (or other area with no debris) in a padded running shoe at a casual pace. Take them off and do the same run barefoot. I guarantee your stride will change dramatically and without any conscious effort on your part. 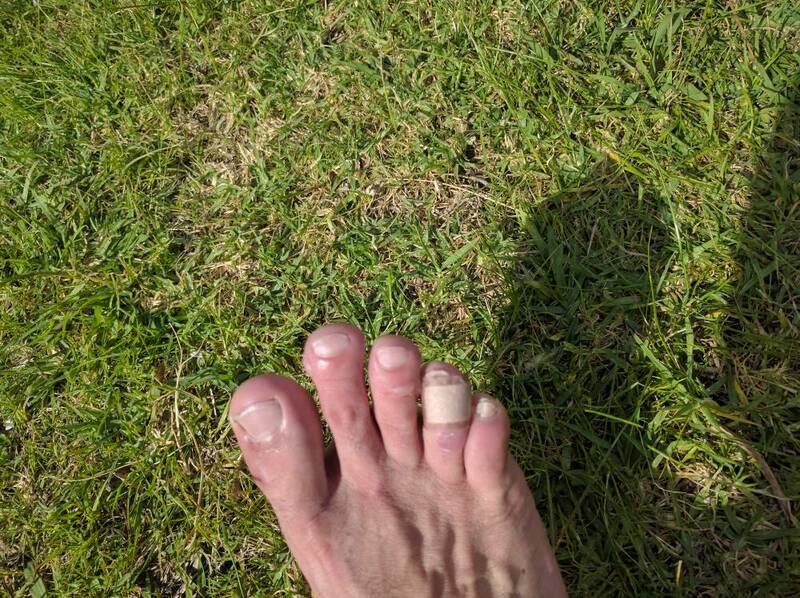 I do recognize that people can get hurt going with minimalist shoes- for the same reason people get hurt trying to go from a sedentary lifestyle to running 5 miles. Undeveloped muscles and joints- the minimalist shoes stress different ones than traditional shoes. You have to ease into it slowly. And for the record, I am not a minimalist zealot. If you have been running a long time in padded shoes and have not suffered injury, I don't think there is a reason to mess with success. I ended up with minimalist shoes after trying a lot of different solutions to shin splints and hip pain. The minimalist shoes are the only ones that allow me to run without pain. I've had great luck with Brooks Beasts and Brooks Adrenaline. I think both are $100+ if not on sale, but I've found some nice deals in specialty shops at the end of season or over the winter. Ok, update. I ended up getting some Asics Gel Numbus.. did a 1/2 marathon this weekend and I nearly threw them out. Check out my feet.... They are ok in terms of foot/leg/stride support but are killing my toes.. and yes, the fitment is correct. The Gel Nimbus chewed up my feet as well. Ill say it again, there is a Swiss made brand called "ON" and they are fantastic. A particular running store in my area carries them and nothing else...the owner was an olympic LD runner. Im never going back.. I found it difficult to find in-depth reviews of shoes. The 2-3 sentence blurbs that the running mags provide usually don't give me enough info. 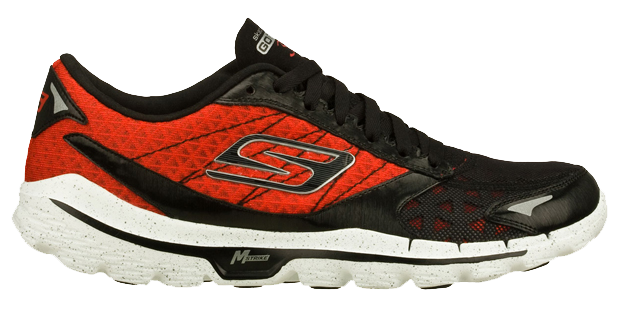 Web-based reviewer Solereview has the most thorough reviews of performance running shoes I have ever come across. What makes the reviews most helpful is that it lists comparable shoes, and references the previous generation/model and compares fit and comfort, etc. This has helped me stock up on an 'older' version of a shoe that worked for me, rather than buying a re-design of a new model that isn't as good (looking at you Nike!!). I live in a rural area, and online purchases are usually the only way I can get the shoes I need. Ideally, a test-run scenario would be best, but not possible for me. What about a Nike Flyknit that will have a more comfortable/flexible toe box? I would check for local running stores and ask advice there. I have flat and wide feet. I went to a local running shop and they suggested a certain pair of ASICS. They’re awesome. I tried buying my own pair after and it didn’t work out.